As The Reels Turn 3 iSlot Guide & Review - Casino Answers! As the Reels Turn 3: Blinded by Love is a 5-reel, 15-line iSlot-branded video slot develped by Rival, featuring expanding wilds, scatter wins, multipliers, a free spins feature and a bonus game. You can play episode three of the As the Reels Turn video slot at Bovada. Coin values on the As the Reels Turn 3 slot machine are $0.01, $0.05, $0.10, $0.25, $0.50 and $1. You can select 1-15 paylines at 1-5 coins per line. The lowest total bet you can make on As the Reels Turn 3 is a penny per spin up to the maximum total bet of $75 per spin. As the Reels Turn is an excellent iSlot for casual players and high rollers will be able to enjoy it as well. There is an autoplay mode available for real money players only. To play As the Reels Turn 3, select your bet and hit the “Spin” button or press “Bet Max” to play all 15 lines with the maximum 5-coin bet per line. The highest paying symbol on the As the Reels Turn: Blinded by Love iSlot is the Casino Chips symbol. If you 5 of these symbols land on a selected payline, you will win the 1500 coin top jackpot. The second highest paying symbol is the El Paradiso symbol, which will pay up to 1000 coins for 5 symbols. If 3 or more Scattered Ivan symbols land on the reels of As the Reels Turn, you will win 10 free spins and activate the Pampers expanding wild. Pampers the expanding wild symbol appears only during the free spins feature and will expand to fill the entire reel. Pampers has a 3X multiplier or a 4X multiplier if you get two Pampers symbols. You can win lots of cash from the free spins feature on As the Reels Turn 3 at Bovada! At any time in As the Reels Turn 3, if you hit 3 Advance scatter symbols anywhere on the reels, you will advance to the next chapter in the As the Reels Turn story. You will also trigger the Danny Costumes bonus game where Danny has to choose a costume for his date with Jamie. The dresser drawers will start opening. You must hit the “Stop” button on a drawer to choose a costume for Danny and win a prize based on the costume Danny wears. All wins pay left to right, except for scatter symbols (which pay any). All wins are multiplied by the bet per line, except for scatter wins. Scatter wins are multiplied by the total bet. There isn’t as much to the As the Reels Turn 3 iSlot as the previous two episodes, which will probably be a negative to most players. The bonus game is difficult to trigger, so don’t expect to hit it very easily. The free spins feature is much easier to get, which can lead to big winnings. You can play all three episodes of As the Reels Turn when you sign up and make a deposit at Bovada! Can players from the United States play the As the Reels Turn 3 online slot? Where can I find a free Flash game of As the Reels Turn? 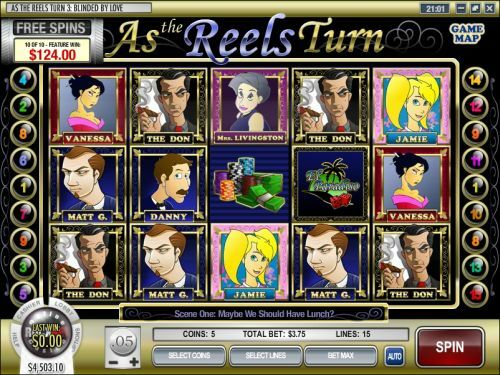 You can play the As the Reels Turn 3 iSlot at the Bovada Instant Play casinos. You can play for free or for real money. If you experience difficulties with the Instant Play casino software, make sure you are using the latest version of Adobe Flash Player. Where can I read more Rival iSlot reviews? For all of the iSlot reviews we have here at Casino Answers, please see our list of Rival iSlots.